Finally a poppers that you can be proud of! 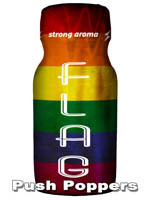 The rainbow flag is now the symbol of hope and tolerance, and we are honored to present you with this new fragrance. The FLAG is an aroma that will add spice during your outdoor or indoor adventures, wherever you are and whoever you are with. Bring it to the parade and share the love!